male pattern boldness: End-of-year projects et al. Who would you rather see framed over your toilet tank? Readers, we have two more weeks before the end of 2010. I have to think realistically about what I can accomplish between now and then. First I'd like to tell you about what I did yesterday. 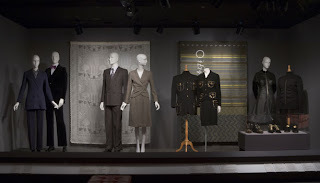 Since it's nearby, I swung by the new fashion exhibit at the Fashion Institute of Technology, called "His & Hers." To quote the brochure (I'm lazy) it "compares men's and women's clothing from the eighteenth century to the present, highlighting their differences -- and their similarities." That's the extent of it. A MUST for fans of gendering and fashion. It's in the smaller upstairs gallery (Japanese Fashion Now is still open in the larger gallery) till May 10, 2011. There's a lot of men's clothes on display, something I really appreciate. I can take only so many couture gowns. More information about this FREE exhibit here. And speaking of his and hers, prepare yourself for tomorrow's blog topic. Can you guess? Meanwhile, one last toggle tidbit. Melton. That's the kind of wool my toggle coat is made out of. I just learned this yesterday when I went fabric shopping and you can blame Meg for that. I don't know a lot about different fabrics but I'm learning. I wore my coat yesterday and I must say it is toasty, perfect for layering, and remarkably lightweight. The melton wool has beautiful drape. I toyed with adding a button or two, but after experimenting with a few hidden tabs and such, decided to leave it as-is. Since the underlined melton is on the thin side, I fear the additional layers would show through (remember the hem issue I raised the other day?) and look lousy. The coats pictured above are made of thicker, blanket-weight wool. Hey, nothing is perfect and I'm just going to love what is, which is what most of you were trying to tell me when I was obsessing the other day I think. But back to fabric shopping. I bought myself a lovely plaid cotton flannel yesterday that coordinates with the lining of the coat. It was splurge (for me) at $7/yd. but it's perfect and let's face it: where are you going to find a flannel shirt in just the right colors for under $20? It's from AK fabrics at 257 West 39th St. 'Tis the season! But more about those tomorrow. I finally got around to removing the stench from my vintage luggage set (or trying to) so I can actually use it for storing fabric and garments and such. Cross your fingers and hold your nose; it's supposed to take a week. Friends, that's it. I hope you're enjoying life stench-free as we close the book on 2010. Or at most a little mildew. Is anybody sewing, or just blogging these days? Am I missing some exciting or not-so-exciting project? Don't be shy -- share! 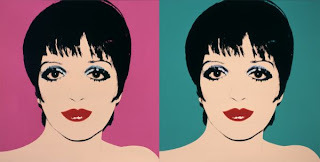 The reason you like Liza better is your dear reader didn't choose a glamourous shot of Cathy, merely a silly one. I love your shawls, Magda! Sew, I have to finish a baby quilt for our 1st grandchild due 1/6/11, a fleece bunting, a knitted rabbit and a nursing nightgown for the mom, our daughter, hopefully for Christmas.... Life's a stitch and then another and another without letting the cookies burn. Sewing, yes. Blogging or reviewing, not so much. If I want to finish before Christmas, I don't have the time. My Christmas project list now reads as-- three pairs of jammies, snaps on a fourth, a two inch circle of yarn dolly hair, a dolly coat and bonnet, and a flannel turtle. I'll knock out the doll and another pair of jammies today and get another cut out. The turtle will be a fast project that I should be able to do in an hour or so. I'm in the home stretch and grateful for it! I'm working on a wool coat, too. No toggles, but it's my first and I'm plugging through, learning as I go. 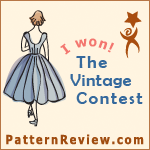 I appreciate your posts... it let's me know that even really experienced sewists are still learning as they go. And the toggle coat looks awesome, by the way. For sure. I just discovered MPB a short while ago while I was looking at reviews for mens Boxers on Pattern Review. I've been checking out your blog since but I never really had anything to contribute. I'm not too blog savvy, hence the Anonymous post. 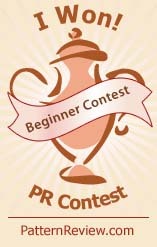 I have thoroughly enjoyed reading your blog and plan to continue checking out your projects. One thing I REALLY enjoy are your photo story shoots. I enjoy your sense of humor a great deal. I wouldn't worry about the slight pull in your Toggle Coat. It's not that noticeable and it just adds character. Of course, you could minimize it by not using the pockets... The bottom line is that you have a coat you can be very proud of and no one else will probably notice it. One last comment about your vintage luggage issue. I haven't heard of using cat litter to remove odors before but I have heard of using charcoal briquettes or newspaper. If you choose to use the charcoal briquettes method, you could line the luggage with some thin paper to prevent soiling the fabric. Afterwards, you can still use the briquettes to cook with... although I don't know if I would consider doing that. You may also try putting something cedar in there to mask the previous owner's fragrances. I look forward to hearing more about your projects. Good luck with the coat, Ginnie! Neither sewing nor blogging. Sigh. I am blogging, but mostly about dollmaking and painting. I am pretty proud of the Frida Kahlo doll I just made though! Im animating. Ive put off finishing an animated short (flash) Ive been working on for near a year. Im going to complete it by the first. 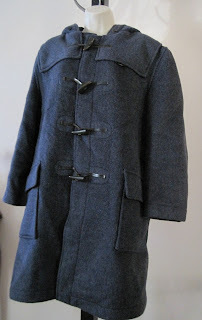 Your toggle coat is gorgeous! The fit and finishing are fantastic. Crossing my fingers for you that the kitty litter does the trick on your vintage luggage. I've been sewing some and finally blogged about it last night and this morning. I still have two pairs of flannel PJ pants to sew as well as cabbage rolls to make.. oh list of stuff to do seems endless! In 2011, I plan to sew and blog more. I haven't even blogged about my latest sewing machine additions that I got two months ago. Have super duper Saturday all. If the luggage problem is mildew, general odor solutions won't work very well. You need to rub in some borax (be careful the dogs don't lick it..), that won't just take care of the smell but kill the spores. And when you can, exposure to sun will be great too. But that'll be a few months yet :-). Happy new year meanwhile.. I just made my third pair of pyjama pants in two weeks... does that really count as serious sewing though? At least I can now sleep comfortably! I love your outfit with the coat. I can barely see the problem with the pulling/pockets. Love love. I also love the Cathy montage, and it's pretty easy to do that on a Mac, so maybe the reader will do it with a more glamorous shot of Cathy, though the silly one is cute. Yup, I'm sewing and knitting and, now that I've finished my holiday sewing, am about to start a coat. It's a great time of year! Peter, for your viewing pleasure, pop over to my blog. Last two posts have a video and a snazzy dress. what more could you want?? And no sewing machines to tempt you. BTW, cute coat and Cathy never looked so good! I think if you knew how much I had to spend on fabric because I live on the far side of the universe, you'd spew. I'd count myself insanely lucky to find decent fabric at $7/m. Usually decent stuff runs me at least double, or more often triple the price. Decent clothes are excessively hard to find, usually of inferior quality for the price. Buh. I'm making piles of hats. I can't seem to stop and don't want to. 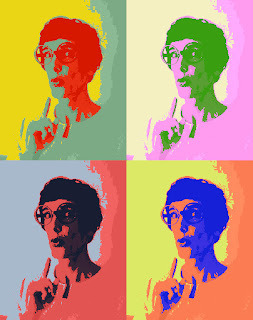 Oh you Silly, it was I who created the Andy Warhol-esque image of Cathy, I'm honored you used it again! There is another way round "toggle-pull". 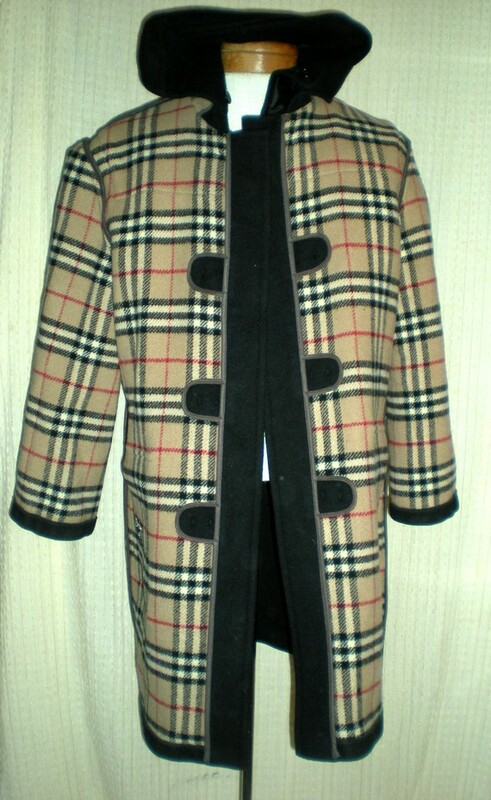 My boy has a duffle coat with a zipper cleverly concealed on the inside. 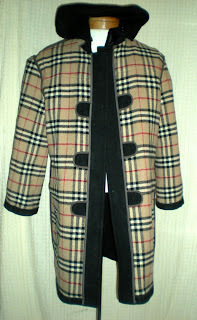 It solves the whole problem, however it is slightly visible when the coat is worn open.